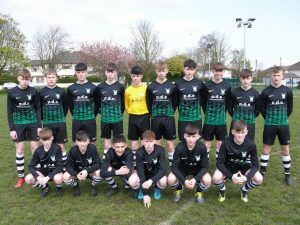 Hanover created a bit of history as they became the first Carlow boys team to reach the national final after this win over St Kevin’s Boys, a powerhouse of schoolboys football. Harps were on the front foot from the off, creating chances for Brandon Kelly and Stephen Smyth, both efforts well-saved. The hosts’ constant pressure yielded a corner on 20 minutes and with it the opening goal, Brandon Kelly headed Kyle Nolan’s dead ball onto the post, but made no mistake with the rebound as he fired Harps in front. Just seven minutes later, Hanover doubled their lead from another corner, this time from the right, which saw Cillian McGrath’s cross powerfully headed home by Kyle Foley for 2-0. There was still time for Kyle Nolan to crack a 25-yarder off the crossbar before the referee sounded the whistle for half-time. Kevin’s made a couple of changes at half-time, but it was more of the same from Harps and within five minutes of the restart Kelly scored a contender for goal of the season, picking up a loose ball 35 yards from goal before unleashing a ferocious drive which nestled in the net to send the Hanover faithful wild. Kevin’s response came from the penalty spot with 20 minutes remaining, but that was as good as it got for the visitors as the Harps rearguard stood strong to ease the club and county into a first ever SFAI Cup final. Hanover: Jason Brennan, Mikee Horohan, Diarmuid Long, Cillian McGrath, Kyle Foley, Jamie Furlong, Kyle Nolan, Jack Begley, Harry Lloyd, Ronan Quinlan, Aaron Bowden, Jack Murphy, Brandon Kelly, Dylan Doyle, Stephen Smyth, Jack Dunne.